TJung: See this one. Does that work? Is there any way I can modify your workflow to add additional keywords that can funnel the download locations to different folders based on the URL or content? Essentially, I would like to have the env variables act as defaults, and while I understand that Alfred 3 makes it easy to make global change to the workflow environment variables, but can you help guide me about how I can might update these variables individually based on the provided keywords/arguments? It then connects to the same nodes as dv. 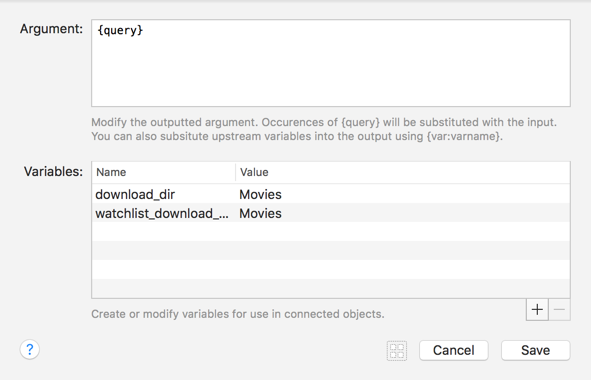 In that example, both actions will download to your ~/Movies directory. As to changing the download location depending on URL, I won’t do that. You’re free to tinker with the script inside the workflow, but that requires a level of complexity I won’t introduce as I don’t see it as worth for the number of people that would use it (and I wouldn’t be one of them). It now uses OneUpdater, so this should be the last time you need to manually update. I'm on Alfred 3 and macOS Sierra public beta 3. Video download is working as expected but I do not get any notification popup's. They do show up in Notification Center but not as popup. Has handling notifications changed in macOS Sierra? No idea. However, I’m using terminal-notifer for the notifications, so if there’s an issue, it should be reported there soon. Since I’m not yet on Sierra, I won’t pursue the case yet. It now uses the new method to call external triggers (you should not notice any difference in usage, unless perhaps that it should be a tiny bit faster in those operations). Updated to use the most recent version of OneUpdater. Checking download progress now auto-refreshes. To update, download the latest version (same URL) or wait a few days (15 or less) and it’ll prompt you to on next usage, since it uses OneUpdater. Is it possible to start downloading a youtube video on desktop and immediately start watching it as it downloads the rest of it so that you don't have to wait fully for it to load to then watch? I remember in Transmission as it downloads torrent files in chuncks, you can start watching the video before it fully loads, would be amazing if you could the same here and prioritise the beginning parts of the video to load first. But I really dislike that I have to confirm on my action as I pass into the script filter. I wish I can just pipe my url into the script filter and it would instantly start downloading in my chosen folder. Is it possible to start downloading a youtube video on desktop and immediately start watching it as it downloads the rest of it so that you don't have to wait fully for it to load to then watch? Might be, with some trickery, but I don’t think it’s something youtube-dl (which this uses) specifically allows. I also don’t think it’s something common to do. If I want to stream a video, I’ll add it to WatchList and view from there. would be amazing if you could the same here and prioritise the beginning parts of the video to load first. The video is already downloaded in order. Since it’s not a torrent, but downloaded from a single server, there’s no reason not to. That said, this workflow downloads the best version possible, meaning that sometimes, especially for youtube, it might actually download two files (one for video, another for audio), and join them (youtube-dl is truly capable). I wish I can just pipe my url into the script filter and it would instantly start downloading in my chosen folder. Why don’t you just change the target in the Workflow Environment Variables? That’s why they’re there. Two extra and unrelated questions. Why do you space the nodes so wildly? I have a hard time navigating that. What’s the t: ? I’ve noticed you add different letters to the start of Workflow names. What do they represent? For the spacing, I actually like spacing it out a little just as preference, I get a better idea of what is going on. And 't:' is a prefix that I use which stands for 'tools'. I find prefixing workflows a lot nicer for organisation than alfred's native 'Category' feature. It's mostly because I have a lot of workflows and I wish to find the workflow I am looking for very fast. 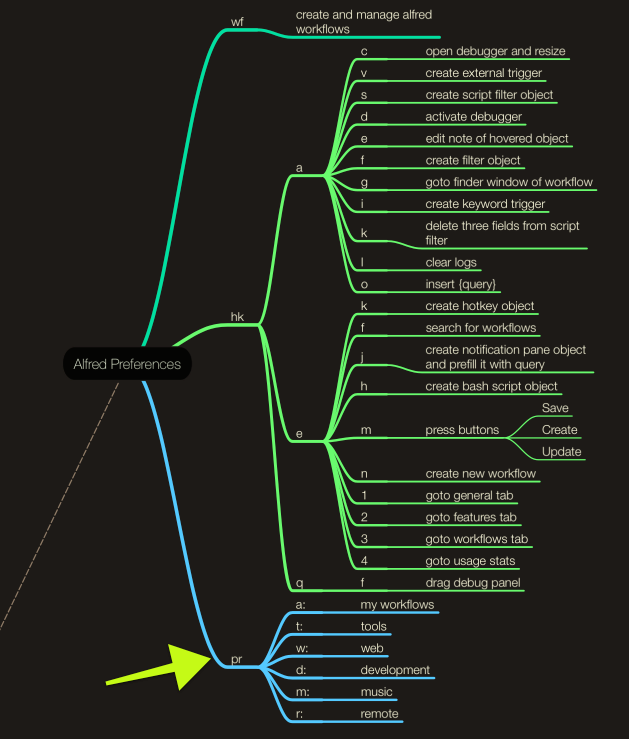 I document my prefixes here (https://my.mindnode.com/H1ejGz58APafNWf3s9MiD9E3CSpkxPTKapJSiNkA) amongst other things. I know it's a bit hard to follow currently but I hope to make it more clear in the future. For example here are hotkeys and prefixes that I use for Alfred Preferences. The prefixes are indicated by the pointing arrow. When I tested out the services, it said invalid URL. But when I pick download to watchlist through Alfred it works. Something I'm doing wrong? I like to right click instead of opening Alfred. I’ll need more details, such as where you tested this on. The service only works if you select text that is itself a URL, i.e. it won’t work if you do it on other text that is a link. This works → http://example.com/ but this does not → hyperlink_example. That’s a limitation of services, and not something I can fix. Fixed macOS Services. At some point I made a change to how URLs are added for download, and forgot to update the Services accordingly (thank you @GhostTheSavage for the notice). Also made a small change as to how to install the Services. Now run :downvidservices instead, and it’ll detect if they’re already installed, offering to uninstall them if they are. So should I redownload the workflow? That’s the fastest way to get the new version. If so, should I delete my current version? No need. Try installing the new one, and the old one will be overwritten. Also, if I have already installed downvidservices the old way, should I uninstall and reinstall? Yes. Simply :downvidservices twice in Alfred. The first will offer to uninstall the ones you already have, and the second will install the updated ones. Thank you for your detailed response. Very professional. I appreciate your time as this workflow has many uses. I haven't tried, but I assume I could download audio from a link? For example, a music link from SoundCloud. I need to research how to make workflows. I am currently learning python and I am wondering if I could practice the language by creating some workflows. Thanks again for everything, @vitor! Your hardwork is appreciated. The update works beautiful! Edit: There are applications out there that do exactly this but they cost an unnecessary amount of $$$. Yours is robust and gets the job done. Thank you for your detailed response. Very professional. I appreciate your time as this workflow has many uses. Thanks again for everything, @vitor! Your hardwork is appreciated. The update works beautiful! I haven't tried, but I assume I could download audio from a link? For example, a music link from SoundCloud. This workflow uses youtube-dl to do the heavy lifting, so every website it supports (and there are a ton of them) this Workflow supports as well. And you can bet that most if not all of those applications that cost money also use youtube-dl under the hood — it’s that good. I need to research how to make workflows. I am currently learning python and I am wondering if I could practice the language by creating some workflows. 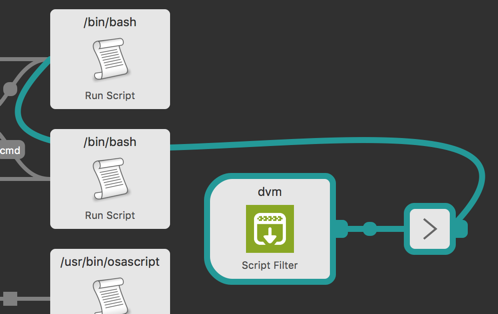 Workflows are a great to run your scripts. So while they won’t give you direct python experience, they might make it easier to just make something simple that will prove immensely useful to you due to being so easy to call from Alfred. That in turn is a great incentive to keep at it and learn more. 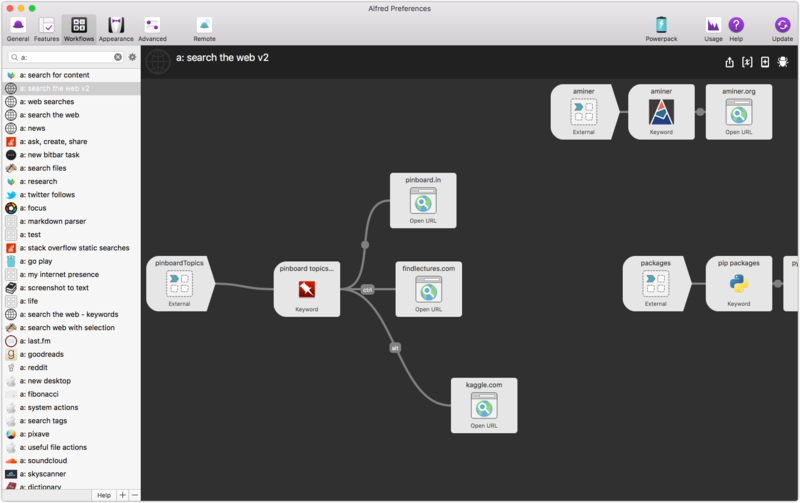 To learn Workflows themselves, start with the official documentation. If you have specific questions (more Workflow-related than python-related), I’m thinking about having open hours to answer those doubts. I still have no set date as so far I have too few interested. I downloaded and installed your workflow, and I agree it's awesome. I managed to tinker with it to change the default download location, and to prevent downloading videos larger than 720p Height. All of these Alfred workflows are great for learning about scripting and the inner workings of OS X.
I have a question though. I 'm not using watchlist, and so I was wondering were the download queue is saved when you select multiple video's to download. I 'm not using watchlist, and so I was wondering were the download queue is saved when you select multiple video's to download. It isn’t. Alfred handles the queueing for downloading. If you’re not using WatchList, the videos are just downloaded in the sequence you added them to your download location.